Originally described as a subfamily of Anapidae, the recently erected araneoid spider family Synaphridae includes three genera, with a total of only twelve described species to date (Platnick, 2009). The family has been reported from southern Europe, West Asia and Africa (France, Italy, Spain, Austria, Portugal, the Baleares Islands, the Canary Islands, Croatia, Ukraine, Turkmenistan, Egypt, and Madagascar). Recently synaphrids have been the focus of number of studies describing their remarkable morphology. 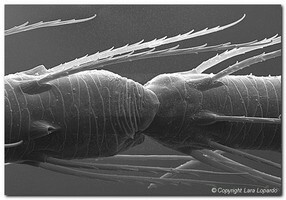 Synaphrids are currently regarded as members of the “Clawless Female Clade” (Lopardo and Hormiga 2008). Synaphrids share with other symphytognathoids (and with some other araneoids, such as cyatholipids or some linyphiids) the absence of female pedipalpal claw and the retention in adult males of at least one of the silk gland spigots of the “triplet” (the set of three spigots that produce the viscid sticky silk characteristic of araneoids and that usually occurs only in juveniles and adult females). Pedipalp of a female Cepheia longiseta, note absence of claw. 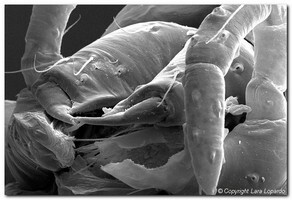 SEM image © Lara Lopardo. The respiratory system of synaphrids is unique among araneoids. Anteriorly, the booklungs have been replaced by tracheae. 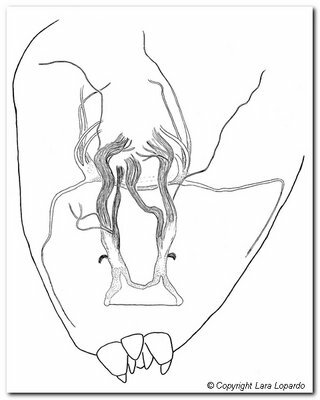 The opening of the posterior tracheal system is externally visible as a wide spiracular slit consisting of two distant rounded openings exteriorly connected by a thin ridge. Internally the spiracle opens to a distinct tracheal arrangement, with two main tracheal trunks arising from a deep, membranous atrium. 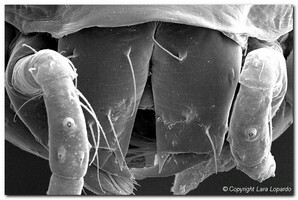 All synaphrids have a unique constriction on the metatarsus-tarsus joint on all legs, and a cheliceral keel that ends in a strong promarginal cheliceral tooth. Males of Synaphridae have also a distinctive tibia on their copulatory organs (palps), which is rounded retrolaterally and pressed against the remaining palp. 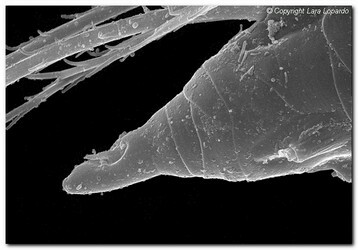 The web architecture of synaphrids has been described for only one Ukrainian species, Synaphris lehtineni, which builds a small and thin sheet web in the hollow depressions of the underside of rocks (Marusik et al., 2005:129). The web structure of the remaining synaphrid species as well as the web building behavior of all synaphrid species remains unknown. Source: Lopardo and Hormiga 2007, 2008, in prep. ; Lopardo et al. 2007; Miller 2007. The monophyly and the phylogenetic placement of Synaphridae has only been recently studied (Lopardo and Hormiga, 2008). Synaphrids have been hypothesized to be either sister to Cyatholipidae or to Symphytognathidae. Generic relationships within Synaphridae remain to be studied. Lopardo, L and Hormiga, G. 2007. On the spider genus Cepheia Simon 1894 (Araneae, Synaphridae). American Museum Novitates 3575: 1-18. Lopardo, L and Hormiga, G. 2008. Phylogenetic placement of the Tasmanian spider Acrobleps hygrophilus (Araneae, Anapidae) with comments on the evolution of the capture web in Araneoidea. Cladistics 24(1): 1-33. Lopardo, L, Hormiga, G and Melic, A. 2007. Spinneret spigot morphology in synaphrid spiders (Araneae, Synaphridae), with comments on the systematics of the family and description of a new species of Synaphris Simon 1894 from Spain. American Museum Novitates 3556: 1-26. Marusik, Y and Lehtinen, P. 2003. Synaphridae Wunderlich, 1986 (Aranei: Araneoidea), a new family status, with a description of a new species from Turkmenistan. Arthropoda Selecta 11: 143-152. Marusik, Y, Gnelitsa, V and Kovblyuk, M. 2005. A new species of Synaphris (Araneae, Synaphridae) from Ukraine. Bulletin of the British Arachnological Society 13: 125-130. Miller, JA. 2007. 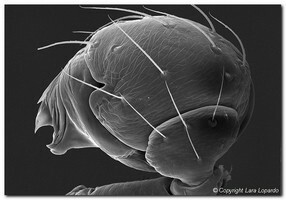 Synaphridae of Madagascar (Araneae: Araneoidea): A New Family Record for the Afrotropical Region. Proceedings of the California Academy of Sciences 58(3): 21-48. Wunderlich, J. 1995a. Die Beziehungen der Synaphrinae Wunderlich 1986 (Araneae: Anapidae). Beiträge zur Araneologie 4: 775-776. Page: Tree of Life Synaphridae. Authored by Lara Lopardo and Gustavo Hormiga. The TEXT of this page is licensed under the Creative Commons Attribution-NonCommercial License - Version 3.0. Note that images and other media featured on this page are each governed by their own license, and they may or may not be available for reuse. Click on an image or a media link to access the media data window, which provides the relevant licensing information. For the general terms and conditions of ToL material reuse and redistribution, please see the Tree of Life Copyright Policies.